During WWII there were four iconic open-topped self-propelled guns used by the major powers: the German 15 cm “Hummel,” the Canadian-designed “Sexton” with a 25-lb gun, the Soviet SU-76M, and the American M7 150mm HMC “Priest.” The latter three were excellent designs and went on to live long after the war, all three serving into the early 1960s with various second- and third-world armies. Two of them, the Sexton and the M7, were based on the reliable US M3 medium tank chassis. 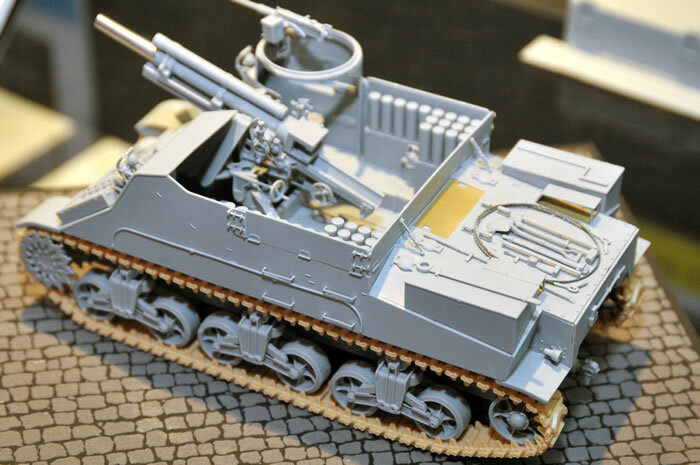 Italeri came out with a kit of a late production M7 that had been modified for Military Assistance Program use in the early 1950s, and while a nice kit for its time, suffered from being both a very late production vehicle and their quirky M4 suspension and T51 tracks. 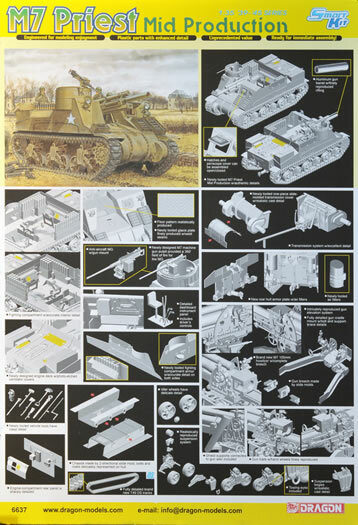 When Academy promised a new kit, it was to be based on their new M3 Lee kit, But when that was noted to have some serious problems, it was held up for a number of revisions. What they eventually produced was a mid-production M7 with a riveted hull, T51 tracks and some of the MWO changes that went with it to include the increased ammunition stowage racks which appeared about the time of the Operation Husky landings in Sicily, based on combat operations in North Africa. It has the production three-section bolted transmission housing with the full-size E4151 right side housing section vice the E1230 used on very early production vehicles and taken straight from the M3 medium tank, top-opening stowage bins on the rear deck vice the side-opening ones from the early production series but not the mesh baskets which appeared on top of them or vents which are seen on late production vehicles. It also has the early model shallow “pulpit” for the .50 caliber machine gun. 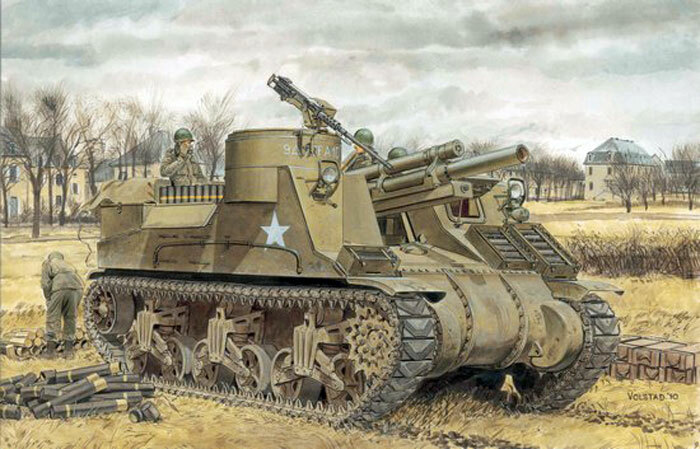 Needless to say, when DML began releasing new mold kits of both the early model M4 Sherman tanks with the early (“M3") type bogie units with integral return rollers and then an excellent M2A1 105mm howitzer, it was only a matter of time before they too issued a kit of this popular subject. While they are focusing on the same model – the mid-production version of the M7 or “Priest” – the results are much cleaner and closer to the prototype. 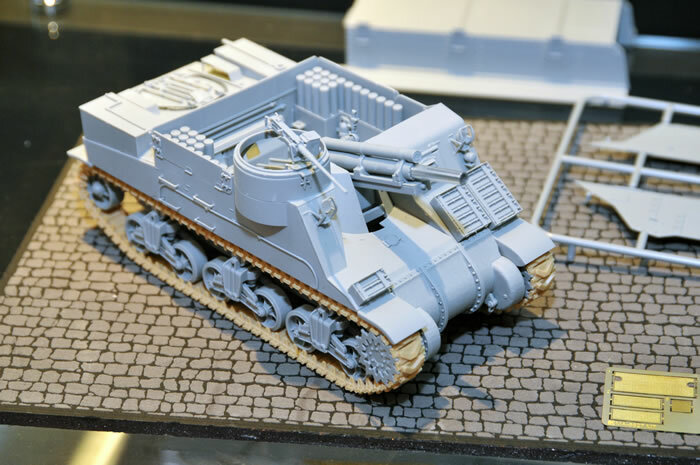 In this case they have produced a mid-production vehicle with some of the MWO upgrades applied such as the raised AA MG “pulpit” and the folding side shields and increased ammunition stowage. The model has the early model bogies with five spoked welded wheels and six-spoke idlers, machined drivers, and T48 rubber chevron tracks. The additional air vents are present on the engine deck as are the covers that go over the top of those vents. Grouser bins with grousers molded in place are provided as is an interior of all visible components. 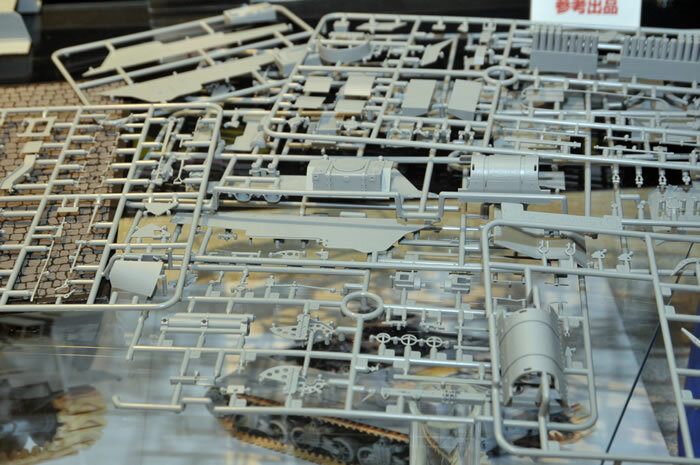 The kit also comes with the current generation of DML’s take on the M2HB machine gun. Top bows are provided but only in their stowed positions. DML did skimp on some items. For example, the ammo racks come filled less four rounds on the right and six on the left; while more to scale than the Academy ones and with at least the dividers in place there are no separate ammo rounds or shell casings provided. All of the engine deck vents are solid with the brass grille work simply mounting over them, but as little can be seen through the original even from a few feet away this may not be bad other than making their installation more difficult to accomplish in a clean manner. The engine access doors are molded closed and the auxiliary air vents are also solid. However, it does come with the earlier “round” air cleaners. The T48 tracks are a good set and represent their prototype well, but photos show them as more common to the later production vehicles and the M7B1 and M7B2 variants. A better choice for “all around” use would have been the T51 irreversible rubber shoe track (which DML also makes as a DS product). Three sets of markings are provided, all for solid olive drab vehicles: Battery A, 73rd Armored Field Artillery Battalion, 9th Armored Division, Germany 1945 (gun A10); Battery A, 231st Armored Field Artillery Battalion, 6th Armored Division, Germany 1944 (“All American/Crazy Helen”, no bumper code); and Battery A, 399th Armored Field Artillery Battalion, 8th Armored Division, Bohemia 1945 (“Minnesota”, gun A2). A set of Cartograf decals are provided and include yellow warning stripes for the ammo shipping canisters.